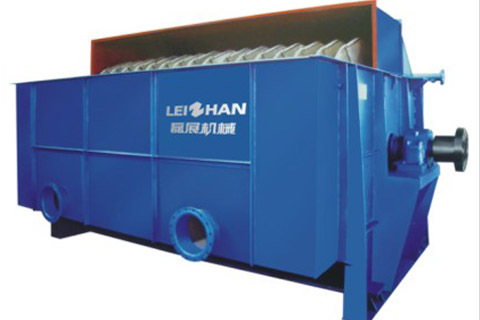 Unlike the traditional vacuum disc filter, the disc thickener have no vacuum and it does not need to be installed on higher floors to meet the requirements of vacuum degree of the water leg pipe. Disc thickener can replace the traditional gravity cylinder thickener. The main components of the disk thickener are filter disc, screen washer, main transmission, tank and feed box and outlet box. Filter Disc. The filter disc is made up of several fan-shaped pieces. Most of the fan-shaped pieces adopt perforated plate structure. Its outside is covered with a stainless steel strainer. The fan-shaped pieces is the support for the strainer. A separate filter chamber can be formed by welding a strainer mesh over the fan section. The fan-shaped pieces are bolted to the center spindle. Screen Washer. There is a nozzle on the washing pipe, and the water pressure of the washing network is required to be 0.6mpa. High pressure water can be used to flush out the slurry adhered on the filter surface and then it enter the next filtration stage. Main Transmission. The speed is reduced by the direct-connected reducer, and the speed of the inverter is adjusted. The normal speed is about 4r/min.